Why do some people's eyes look like keyholes? Some people's eyes really do look like keyholes to their souls. It's not something out of a romance comic. It's a condition called coloboma. The human body never stops finding ways to surprise us. 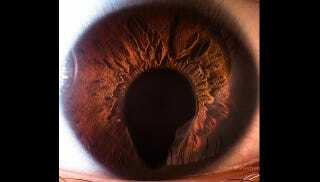 Coloboma, or "keyhole defect" is a distortion of the iris. It can happen in one or both eyes, and gives the pupil a look that's vaguely otherworldly. Although it can happen after trauma to the eyes, most coloboma happens while the eye is still developing. The eyes start developing at about 22 days, and they do so in multiple layers. The forebrain of the fetus starts bulging outwards, developing two little balls on stalks. Meanwhile, the ectoderm - an outer layer of tissue - starts to thicken over the two balls. Suddenly, the balls begin to hollow out. Imagine putting your thumb into a ball of dough to make it into a cup. Minus the thumb, this is what happens. The cup starts developing into the differentiated tissue that will form the retina and most of the eye. Sitting in the cupped tissue, like an egg in an egg cup, is the thickened ectoderm, which will become the lens of the eye. At last, when the eye has finished developing, the walls of the cup come forward, closing on the lens and sealing together with just a small hole in the front, forming the eye as we know it. In one out of every 10,000 babies, the sealing process doesn't entirely finish. Instead of a circular hole as an opening, there's a keyhole opening where the tissue from the cups hasn't completely finished sealing itself up. Coloboma can cause vision problems for coloboma patients, in part because of the light leakage from the expanded pupil, and in part because the lack of closure can leave some of the circulatory system that the eye is supposed to have unfinished. Much of the time, it just results in slight haziness of vision, a dislike of bright lights, and a lifetime of people asking them where they got those cool contacts.